The PerlaVita dichroic line of European beads exhibit some of the most brilliant colors on any bead we sell. This is due to the exception optical properties of the layer of dichroic glass that we apply to a base of Murano glass. Depending on the dichroic glass coating, different colors are reflected, providing a wonderful multi-colored effect. For this bead, we started with a black base and added black salmon dichroic glass, giving off an array of orange, green, and yellows. 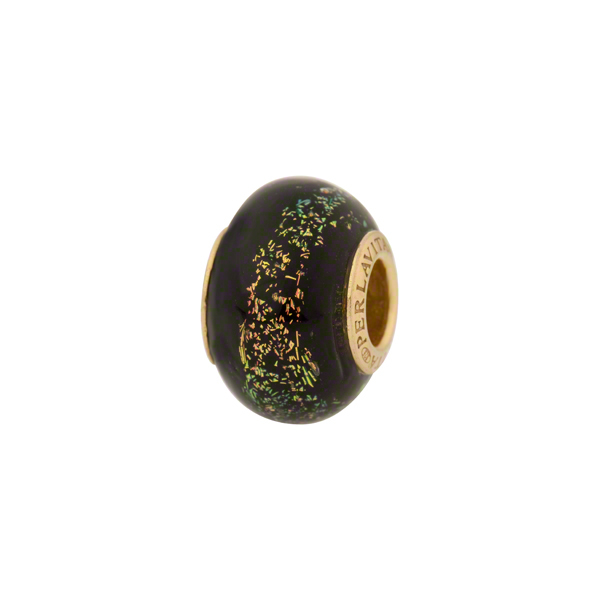 This rondel shaped bead is approxmately 14x10mm with a 5mm hole and Vermeilinserts. Fits on most brands of modular bracelets. Complete with authenticity card.